Panauti is another one of top 10 places to visit in Kathmandu Nepal. one of the finest Newar settlements in the region is the village of Panauti. It is built at the confluence of two rivers in a small valley surrounded by examples of early temple architecture. Nagarkot is another one of top 10 places to visit in Kathmandu Nepal. A 32 east drive from Kathmandu at the altitude of 2,175 (700 ft) is Nagarkot, The ridge offers possibly the best display of Himalayas including Sagarmatha (Mt. Everest) and many others like Manaslu, Ganesh, Langtang, Choba Bhamree, Gauri Shankar, Shisa Pangma and much more to count. Visitors are recommended to stay there overnight to enjoy the sunset and sunrise. Nagarkot is one of the best places to visit near Kathmandu Nepal. 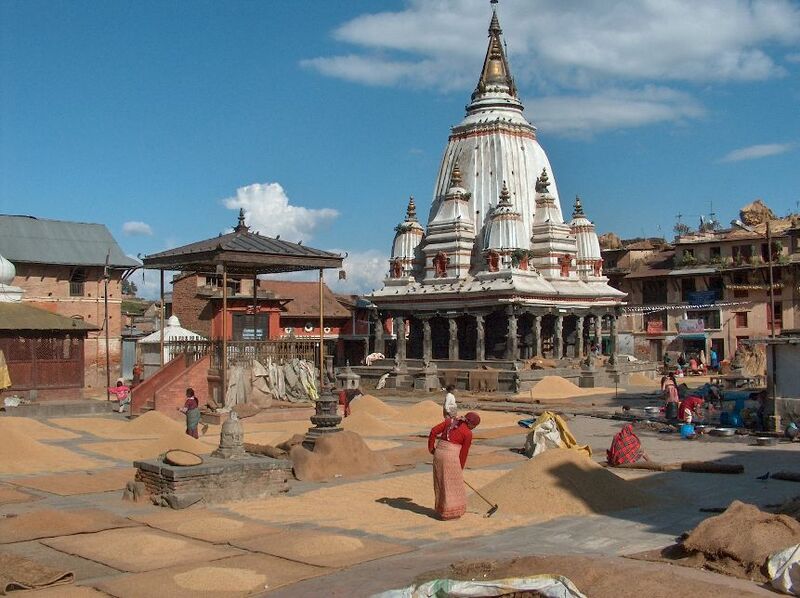 image src is another one of top 10 places to visit in Kathmandu Nepal. A 32 east drive from Kathmandu at the altitude of 2,175 (700 ft) is Nagarkot, The ridge offers possibly the best display of Himalayas including Sagarmatha (Mt. Everest) and many others like Manaslu, Ganesh, Langtang, Choba Bhamree, Gauri Shankar, Shisa Pangma and much more to count. This place was the ancient fort of Kathmandu valley built to monitor and observe the external activities of other kingdoms of Nepal. Gradually it became popular as an international hill station and summer retreat for the royal people. This place is a great place of recreation for the nature lover and therefore provides high opportunities to hike through several routes. Similarly, paragliding is also the source of entertainment here along with the enjoyment of the view of Everest. Nagarkot view tower is also one of the favorite destination as it provides 360 views of the Himalayas, Kathmandu valley and the national park. It can be hiked in about one hour by the hikers. It is mostly hiked during the early morning in order to have the magnificent view of sunrise adding the beauty of the Himalayan range. Thickly forested hills of pine trees would certainly act as the cherry on the top of the cake. The hike includes Nagarkot nature trail, Tamang village walk as well as the panoramic hiking trail with the perfection to enjoy the superficial beauty of nature. With the provision of various resorts for people to stay, people can choose the accommodation of any kind. Surrounded by the hills with a thick forest of pine trees, Nagarkot allows the people from all across the world to enjoy the immense beauty of nature. With the spectacular hiking routes and walks, people can enjoy the nature along with the views of broadest Himalayan ranges and the sunrise at the early morning. Since the time Nepal use to rely on the barter system, people of Nepal used to travel to Tibet for salt and gold and similarly Tibetan use to enter Nepal with the flock of sheep during a festival like Dashain. The trading center was none other than the beautiful place, Dhulikhel. Dhulikhel is situated in the Kavrepalanchowk district of Bagmati zone of Nepal. 16,263 people, as per Nepal census 2011, in 3291 households reside here. Located in the eastern part of Kathmandu valley, this place can be reached at distance 30 km southeast from Kathmandu valley and 74 km south west from kodari. Two highways B.P highway and Arniko highway passes through this beautiful place, Dhulikhel. As mentioned above, Dhulikhel used to be the trading center for centuries; it is still the commercial route linking Nepal to Tibet. Arniko highway connects Kathmandu with the border of Tibet, kodari. After connecting Tibet with better infrastructure and roads, Dhulikhel developed itself as a tourist destination. From the time of trading with Tibet, Dhulikhel is considered as the ideal station for the overnight stay while going to Tibet and returning to Kathmandu. People who like to relax with the natural beauty and enjoy luscious greenery on the nearby place; the perfect destination for those people is Dhulikhel. With the panoramic views of Snowfed Mountains along with the luscious greenery in the hills and beautifully carved agricultural terraces, caters the immense pleasure of the natural beauty to the viewers. Dhulikhel offers the view of the Himalayan ranges that stretches from Mount Annapurna in the far west to Mount caroling in the Far East. More than 20 Himalayan peaks can be viewed from the beautiful town Dhulikhel. Dhulikhel is another one of top places to visit in Kathmandu Nepal. A scenic 30 km drive along the terraced paddy rice field on the Arniko Highway leads to Dhulikhel, at an altitude of 1600 m. This place is famous for its vantage location for viewing the Himalayan range from Cho-yu in the east to Himalchuli in the west. The people from Newari, Brahmin, Chhetri, Tamang and Dalit community, residing in Dhulikhel shows the enrichment of cultural diversity of this place. The position, scale and the gap between the buildings, temples show the ancient planning with its own meaning. The narrow streets in the town give the glimpse of the medieval period for about five centuries ago. Numerous temples in the town like swetbhairav, Narayan and gorakhnath depict the Newari tradition and culture. Dhulikhel has been also identified by the famous Buddhist monasteries named Namobuddha; religious sites of Buddhist after Boudhanath and swayambhunath. This place is being popular for picnics, night out parties, seminars, gatherings and other programs. People also visit Dhulikhel on the weekends to have a good time. Dhulikhel is the major tourist spot and is famous for natural as well as the historical reasons. The place is the main attraction of tourists to enjoy the luscious greenery and broad view of Himalayan range. With the existence of Kathmandu University, the charm has been added to the beauty of Dhulikhel. The presence of luxurious hotel, lodges, and resorts provides the ease of overnight stay to the internal as well as the external tourists. This place is regarded as the old Newari town; a small place that can be easily explored on foot for good views. Among various beautiful hill stations located nearby Kathmandu valley, Kakani is also one of those. Kakani is a hill station located in the Nuwakot district of Bagmati zone situated in the central development region of Nepal. Easily accessible from the Kathmandu valley, this place lies at the distance of 23 km to the north west of Kathmandu. As per the information regarding 1991 census, Kakani village development committee comprises the population of 7816 living in 1343 households. Kakani has its own enrichment of natural beauty, people and their culture and tradition as well. This place provides the panoramic beauty of nature and Kathmandu valley. Since this place is located at a certain distance from the crowded Kathmandu city, it is less crowded and more lovely destination that provides excellent mountain views of Ganesh Himal, Langtang Himal, and Mount Annapurna. Kakani depicts the beauty of Ganesh Himal to the north. Besides the Himalayas, the beautiful oak and rhododendron forests to the south slope leading down towards Balaji further add to the spectacular beauty of Kakani. It is one of such most accessible settlements from Kathmandu over 2000 meters that has a British Gurkhas welfare bungalow; a century old villa used by British, and also the number of hotels for the internal people as well as foreigners to stay overnight. The hotels provide simple and basic accommodation facilities for the people who desire to stay here. This village also has the memorial park to the victims of Thai Airways International flight 311. Along with the exploration of natural and scenic beauty in the Kakani village, it is also the ideal place to explore the Nepalese village culture. The oak, rhododendron and pine forest provides the interesting forest hike route. The route is used by visitors to visit a trout fish farm. Kakani is another one of top 10 places to visit in Kathmandu Nepal. One and half hours (29 km) drive from Kathmandu along the beautiful mountain highway on the Trishuli road is scenically rewarding with green forest and mountain terraced cultivation. Besides the natural beauty of the village, the place also provides the insight of the rural life of the people living in the rim of the Kathmandu valley. People of this place mostly rely on the strawberry farming for their livelihood. The implementation of the United Nations Development Programme project has helped the local farmer’s cooperative for the production of about 250,000 kg of the strawberry per year. The most beautiful and recreational spot, Kakani also provides the opportunity to have a panoramic view of colorful hills full of rhododendron and orchids during the month of March and April. The place is mostly famous for the picnic, family outing, get together, cycling, couples, as well as overnight stay. Destination Kakani, situated few kilometers away from the capital city of Kathmandu, is a beautiful hill village of Nepal. Panoramic view of mountain ranges from Ganesh to Annapurna can be enjoyed from this beautiful place. Luscious greenery decorated with the rhododendron and orchids flowers provides the most beautiful view to the visitors. Provision of basic accommodation facilities and easy access from the Kathmandu valley, Kakani has been visited most frequently by the people. Gatherings, parties, picnic are organized in this recreational spot for enjoyment. Namobouddha is another one of top 10 places to visit in Kathmandu Nepal. There are many religious places and view points around the Kathmandu Valery. One of them is Namobouddha. This is a one hour drive or 3 hours trekking from Panauti or from Dhulikhel. Very much respected place by Buddhist for its religious importance also offers beautiful countryside and commanding a view of the surrounding mountain. Among the three main stupas of the Kathmandu valley, Namobuddha is the one. Situated at about 40 km to the south east of Kathmandu valley, Namo Buddha is easy to travel from the Kathmandu city. It is one of the most important Buddhist pilgrimage sites of Nepal. It is said that the stupa was built on the bones and hair of Prince Mahasattva. As per the myth associated with the Buddhist religion, it is said that this is the place, where Buddha in his previous life as a prince, gave the flesh of his body to the hungry tigress and her small cubs. The place is generally called as Namo Buddha from the name of pilgrimage. It is situated at the hill top of panauti and is famous Buddhist pilgrimage located at kavre district of Bagmati zone in the central development region of Nepal. Though myth has added its own religious norms to the pilgrimage, the site where it is located and the natural beauty to the visitors. The stupa is located on the slightly elevated pleasant landscape. And as per the myth, the stupa is built upon the bones and hair which remained after providing flesh to the tigress and her cubs. The landscape resembles a lotus with eight petals and the sky above has the form of a wheel with nine spokes. It is a place highly esteemed by the people from all over the world, east and west. This site since is far from the crowded city, this is the right place for meditation. It is very quiet and pure with clean and pollution free environment. The beautiful view of the sunrise in the morning time and sunset at the evening is also enjoyed by the visitor from this place. The magnificent view of snow- covered Himalayan ranges looks so amazing and pure. Namobuddha hiking day tour is a popular walking expedition that takes to the Namo Buddha hill and throughout the hiking, route hikers can enjoy the natural beauty of greeneries, forests, and the traditional villages. The hiking route also covers the also provides the beautiful view of the traditional Newari village of panauti. Other attraction of Namo Buddha includes monasteries, a school for young monks as a part of the monastery and numerous other cultural heritages. 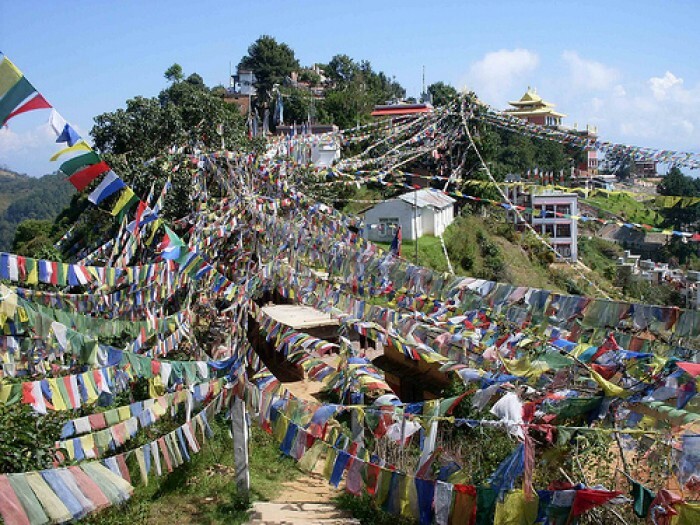 Namo Buddha is famous Buddhist ancient monastery that is surrounded by the Tamang settlements. 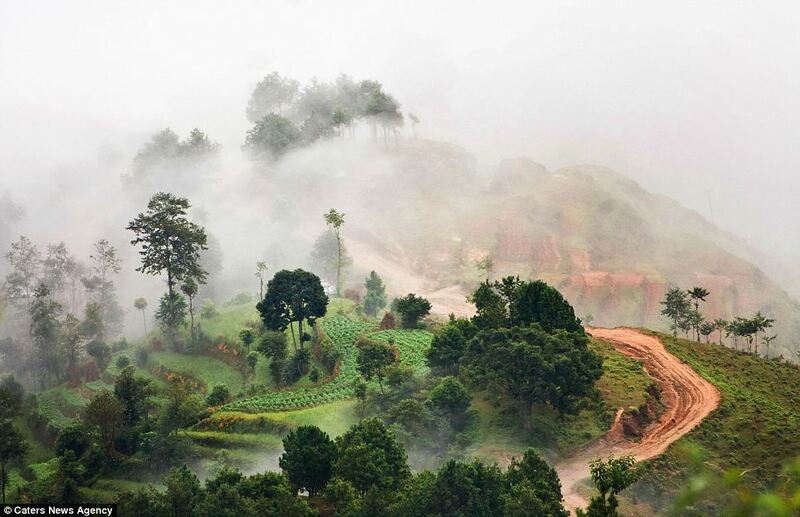 Along with the Buddhist monastery legend, the site also attracts its visitors with the natural and scenic beauty. Traditional villages with its own culture and tradition, rituals also in a way attract the visitors. The hiking trails rejoice the mind and heart of the hikers with the scenic beauty. Beautiful terrace farming landscapes, a number of temples surprise the visitors with the immense beauty. This place is very much suitable for those people who look for the short adventure activity nearby Kathmandu valley to explore outside of the city’s crowd.Namo Buddha is a beautiful place to enjoy the sunrise in the morning and sunset in the evening. The Godavari is another one of top 10 places to visit in Kathmandu Nepal. The Godavari is one of the major tourist attractions near Kathmandu city. Located on the southwestern edge of Lalitpur district, Phulchowki is a nice picnic spot. It lies 14 km from Patan, at the base of the 2715 m high Mt. Phulchowki (Mountain of Flowers). Really these are the places we must observe…I agree that kathmandu valley is very rich in its heritages. .It has a huge power to attract tourist all over the world☺.. Fantastic article about top ten places in Nepal! Long time I am searching information about the top list and your blog helps me a lot! Thanks for sharing this amazing info. Great one. I have one request to all the Nepalese People. Those who will visit beautiful places around Kathmandu or anywhere, Please, do not throw garbages anywhere. Nowadays, many picnic spots are filled with plastic bags, bottles, etc. Thank you. hy sir . nice article .thanks for the information .